There’s an artifact, #427, in the Wayne County Historical Society of Ohio’s collection that has not been on display for a number of years and sits quietly in a drawer. However, it is among the earliest of artifacts collected for the original 1904 Wooster Public Library Museum which was absorbed by the formation of the Wayne County Historical Society of Ohio in 1958. Though it is small, only about 4-inches long, oddly shaped, and ruddy brown in color, it literally has an explosive story. This small object may be the infamous clay Indian pipe that caused the explosion that knocked-down the Stibbs Mill store and killed one man and injured several others. Artifact #427 is the Stibbs Indian pipe that was involved in the Stibbs Mill store explosion. Joseph Stibbs, erected the first grist mill in Wayne county in 1809 on the Apple creek, about a mile east of Wooster, Ohio. Some time after, Stibbs, sent a man by the name of Michael Switzer, who opened for him, in a small building attached to the mill, a store, consisting of a small stock of goods suitable for the early Wayne County settlers and local Indians. One morning a startling and tragic incident occurred in the Stibbs Mill store where William Smith, Hugh Moore, Jesse Richards, John H. Larwill, and five or six Indians had gathered with Michael Switzer, the store manager. While Switzer was in the act of weighing out some gun powder from an eighteen-pound keg, the Indians were quietly smoking their pipes filled with a mixture of tobacco, sumach leaves, and kinnickinnick or yellow willow bark, when a puff of wind coming in at the window, blew an ember from one of their smoking pipes into the powder keg. A powerful explosion ensued. The roof of the building was blown into four parts, and carried some distance away; the sides fell out, the joists came to the floor, and only the floor and chimney were all that remained of the structure. Michael Switzer, at the center of the explosion, quickly died within a few minutes. William Smith was blown through the partition into the mill, and badly injured. Jesse Richards and the Indians were also hurt, and all somewhat burned. Larwill, who happened to be standing against the chimney, escaped with very little harm, except having, like the rest, his face well blackened, and being knocked down by the shock. The Indians, fearful that they might be accused of doing it intentionally, disappeared from history after a council of citizens called for an investigation, which was held on the bottoms, along Christmas Run creek, west of Wooster. Henry Howe provided no further information and it is unclear what conclusions were drawn from the investigation or what happened to the Indians that survived the explosion. Evidently, after the explosion, mill owner Joseph Stibbs was looking over the ruins of his store and damage to his mill. While poking around in the debris he discovered the fatal clay pipe, or what may have been one of the pipes the Indians were smoking in the store, and he saved it. The Wooster Museum came into possession of this pipe, almost 125 years after the explosion, when Museum curator, Alvin Rich, embarked on a quest to find the pipe after reading Howe’s story about the pipe and explosion and hearing local rumors that an Indian pipe survived the explosion and was intact. Eventually, Joseph Stibbs’ son, Thomas Stibbs, became the owner of the pipe, and then Thomas Stibbs’ son, William Stibbs, in due course came into possession of the pipe. Meanwhile, Alvin Rich followed clues for the location of the pipe that led him from Wooster to Florida, to New Jersey, and back to Wooster, and thence to New Jersey again in 1935. As it turned out, William Stibbs, the grandson of Joseph Stibbs, had the pipe all during Alvin Rich’s quest for it and had been traveling just a jump ahead of Mr. Rich, who was desperately trying to find him. William Stibbs was 80-years-old in 1935 and considered the old red clay Indian pipe one of his most cherished family possessions. He and his sister, Emily, both said they remembered distinctly seeing the pipe lying in a position of honor on the parlor table of their home when they were children. Furthermore, they said it used to smell very strong of tobacco. When William was a boy, as a practical joke he once talked a lady into taking a big whiff of the pipe and she recoiled and yelled, “the odor of it!”, but that pungent smell is all gone now and only a memory. After the death of William and Emily’s father, Thomas Stibbs in 1877, their home in Wooster was broken up; his wife Mrs. Stibbs, son Edward, daughters, Mary and Emily moved to New York City. 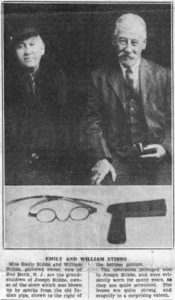 While William Stibbs and the pipe stayed in Wayne County for a number of years with the pipe stored tightly in a box. Later in life, William moved to Florida, and from there by progressive moves to Red Bank, New Jersey, then Newark, New Jersey, and then back to Armstrong just north of Wooster, Ohio and finally back to Red Bank, New Jersey sometime in October of 1935, all the while keeping cherished pipe with him. 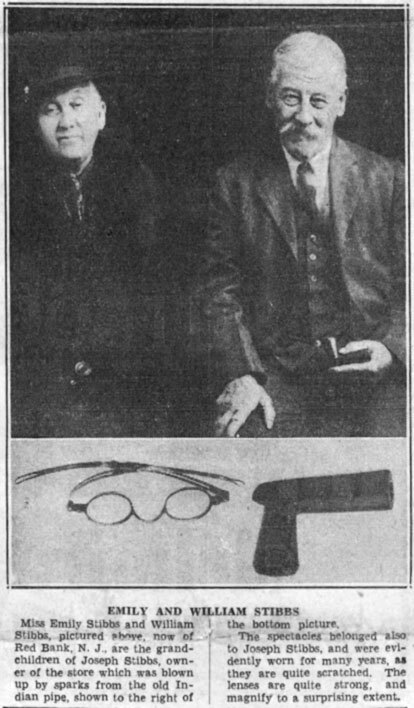 When Alvin Rich finally caught up with William Stibbs at the end of October 1935, William and his sister Emily Stibbs agreed to present the historical Indian pipe that was involved in the explosion of Stibbs Mill store to Alvin Rich to place in the Wooster Museum, believing it to be an appropriate place of safe-keeping for the pipe and its story. At that same time, the Stibbs’ also gave another couple of historic items of interest to the museum: the hand-hammered silver spectacles worn by their grandfather, Joseph Stibbs, and an oil portrait of him in which he wore the same silver spectacles when he had his portrait painted. This portrait of Joseph Stibbs currently hangs in the General Reasin Beall house; a fitting place as Joseph Stibbs was married to Elizabeth Beall, the daughter of Gen. Reasin and Rebecca Beall. William Stibbs died in 1939 and was followed by his sister Emily dying in 1947. The items they gave to the Wooster Museum in 1935 are still a valuable contribution to our collections. The Wayne County Historical Society of Ohio is honored to be stewards of such original local artifacts and have physical evidence of local history that you may read about in the history books. To me the Indian Pipe looks to be stone not clay? Indians used catlinite which was a red mud color.